Nineteen days ago, we drove into Alhaji Buba’s compound, (‘Buba’ being short for ‘Abubakar’,) and set up camp. We were nine in number, a team of drivers, police escorts, masons, Shane, me and a cook! And we got immediately to work. Our job? To enroll children in two schools, Bobi #1 and Bobi #2, hire teachers, build a teachers’ quarters and begin classes! Also, Shane had his own work to do, marking all water sources, including boreholes, streams, and dams, on the GPS map for Chester Novack, the hydrologist on this Holistic Land and Livestock Management project. So, we had a lot on our plates! On Sunday, the masons measured off the teachers’ quarters, which would be two buildings of four rooms each, with verandahs and a thoroughfare in between, bathrooms and toilets. We cleared an area for Shane and me to set up a new camp, as the first place we had pitched our tents, in Alhaji’s compound, was surrounded by kids day and night! We were soon to regret the move. The children loved Shane! Three little girls we called his ‘groupies’ seldom left his side! storm with high winds and heavy rain. We were sleeping in our tents when the rain collapsed the framework and tarp above our heads but were not thankfully not hurt! We slept in the pickup for the remainder of the night and moved back to Alhaji’s compound the following day! Being surrounded by children was not so bad after all! Shane kept very busy with Hunter, (an old man who knows the reserve like the back of his hand,) identifying the water sources and grazing land on the reserve. We were very fortunate to meet with the Governor of the State regarding the serious encroachment by farmers on the reserve, and to get his promise that the farmers would be relocated gradually, and the land returned to its rightful owners. importance of education in their children’s lives. The previous day I had told them the story of the Fulani man and his one precious cow, (he learned the hard way that his children were more important than his cow,) and this day I told them how I’d first met the Fulani, how with Alhaji Mogodi and the support of ICCM we’d opened schools for Fulani children in several states. I congratulated these Fulani parents for their eager support of schools on this reserve, letting them know that their strong involvement and interest in the schools would make all the difference in their children’s lives. School’. Courtney is Shane, Savannah and Phoenyx’s mother. I’m so happy that Shane was able to be here, to be a part of opening this school bearing his mother’s name. Bobi #2 is named ‘Bailey Robinson Memorial Primary School’. Though Courtney and Bailey have gone to be with Jesus, they will forever live on in our hearts. It was so enjoyable to live among the Fulani in Alhaji’s compound. To spend time with the children, and other family members. One little boy won us over completely – that was little ‘Abu’, a Down’s Syndrome child. Sariki Ahijo’s family includes one polio victim; we’ll need a wheelchair for her so she can attend school. Sariki Bello’s mother, though nearly one hundred years old, is as physically and mentally fit as a woman half her age! Must be all that good ‘no-no’ that the Fulani love to drink! That’s cow’s milk mixed with millet, by the way! Many women from the reserve came to greet us during our time with them. Young men came, wanting adult literacy classes. parents were delighted with their new schools! are in great shape, the teachers are wonderful, and we’ve appointed Halliru to supervise the program. 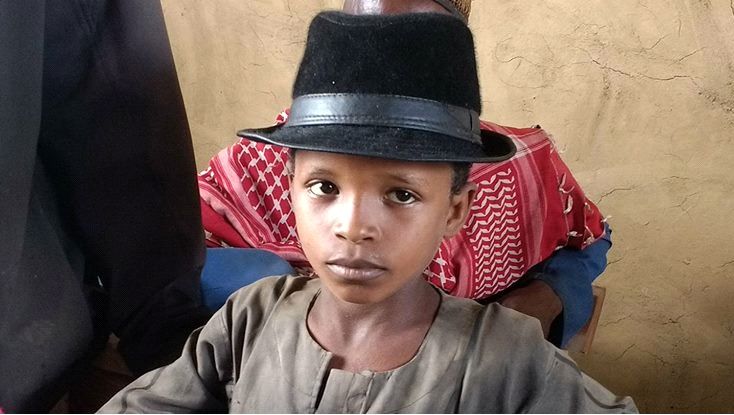 Halliru is the nephew of one of the kings, Sariki Bello, is highly connected in both the State and local governments and is truly motivated to make the schools a success. the force Clement had to use to get out of the ditch damaged the gearbox, because now the Sequoia will only go in reverse, and because (according to Clement and Danjuma, our two drivers,) there are no qualified mechanics anywhere except Abuja, we had to tow the Sequoia, using the pickup, all the way home. A journey which normally takes no more than four hours took two full days! The Sequoia is parked in my driveway now, with a mechanic coming tomorrow to repair the gearbox! Such is life! Shane did SUCH a nice thing for the Fulani on our last day in the reserve. He bought a full sack of rice, two baskets of red onions, tins of tomato paste and a RAM! The ram was butchered, the meat and other items divided among the three reserve leaders: the two Kings and Alhaji Abubakar, our gracious host. Every family cooked their own food, then we all came together to eat! It was the perfect way to celebrate the completion of this school project! Yay, Shane! I don't know how to tell you how AMAZINGLY, UNBELIEVABLY, WONDERFULLY WELL this Bobi schools project has turned out. 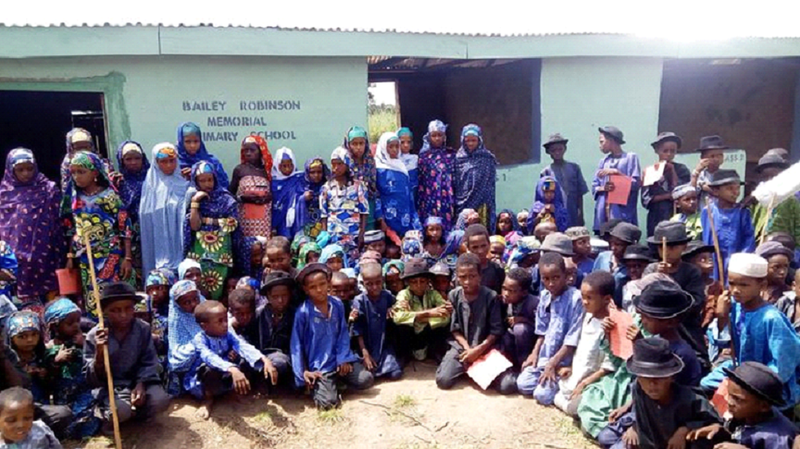 Three hundred Fulani kids in school, parents overjoyed, eleven great teachers in place, teachers quarters finished, no accidents, no sickness, no trouble of any kind. Great staff. expecting more miracles in that place! Stay in touch for regular updates!